Understand what code groups and codes are and when to use them. Codes help you organize time entries. To get started head to the Codes section in the Timesheets tool. Code Groups allow you to organize your codes based on type. e.g. If you are going to create codes for using a forklift and a concrete truck, you could create a code group called Equipment and include the codes Forklift and Concrete Truck in that code group. You can add code groups by clicking the +New Code Group button. Codes are items that allow you to categorize your time. For instance, you could create a concrete code for tracking how much time was spent on concrete. 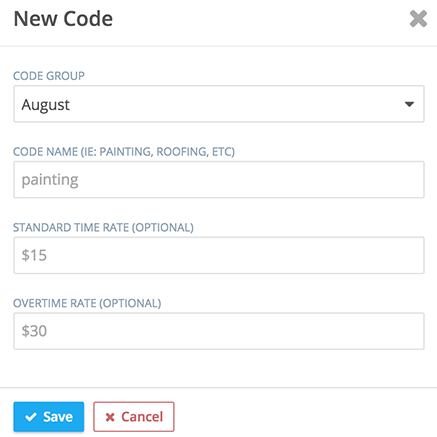 Codes are flexible and also allow you to assign standard and overtime rates to them. To start click the + New Code button. This will bring up a pop up window with different fields to fill out. It's important to know that any Standard or Overtime rate (ST, OT respectively) will override the rates set to individual employees. It's also good to know that entering that info is absolutely optional, as displayed. Once a code is added to the system all workers will be able to use it in any shift detail they'll need to. Let us know if you have any issues with any of this and we'll be glad to help!